Home > Wearables > Will conductive inks help wearables go truly wearable? 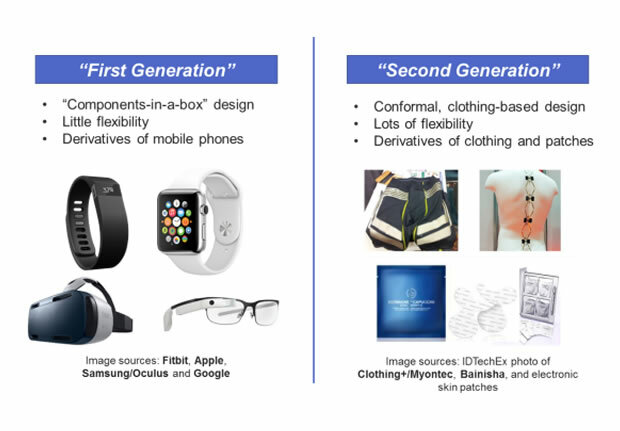 The first generation of wearable devices are constructed using mature, rigid technologies put inside a new box that can be worn. These are often bulky devices that are not truly wearable in the sense that our clothes are. This is, however, beginning to change... albeit slowly. New conformal, clothing-based components are emerging. By Dr. Khasha Ghaffarzadeh, Research Director, IDTechEx. Further announcements last week from Google’s Project Jacquard, in collaboration with Levis, shows that the technology and fashion industries are starting to make real progress through collaboration. This project is but one example of work being done. The IDTechEx Research report, E-Textiles 2016-2026: Technologies, Markets, and Players, finds that e-textiles are on the cusp of rapid growth, forecasting the market to increase from under $150m in 2016 to over $3.2bn by 2026. Many still argue that e-textiles are solutions looking for a problem, but IDTechEx Research finds that there is tremendous interest and progress right across the value chain. This includes material suppliers, traditional textile companies, contract manufacturers, brand owners, etc. Conductors will inevitably play an indispensable role in any e-textile system. Naturally, therefore, conductive inks suppliers are all very interested. In parallel, conductive ink suppliers face challenging conditions in their traditional well-established market sectors. For example, IDTechEx Research report, Conductive Ink Markets 2016-2026: Forecasts, Technologies, and Players, forecasts that the combined market for the previously well-established photovoltaic and touch screen edge electrodes will achieve a measly CAGR of 1-2% between 2016 and 2026. The latter segment is forecast to decline whilst growth in the former will be hugely constrained thanks to the decreasing average silver consumption per cell. In fact, these traditional markets are increasingly characterised by low demand growth, intense competition, high customer price sensitivity and low customer loyalty. This is yet another reason why conductive inks suppliers are hugely interested in new high-growth applications areas such as e-textiles. Conductive inks win on their universality? Conductive ink suppliers are touching and feeling their way into the e-textile market. Many have launched specially-designed inks on the market. Some examples are shown below. Most are also having to proactively help form and develop the nascent value chain. This is currently still more of a push than a pull market. This is a complex space since conductive inks are one of many approaches being concurrently developed for e-textiles. To name a few, these approaches include metal cabling, textile cabling, conducting knits, conductive wovens, conductive inks, etc. There is a paucity of verified technical information and well-defined figures-of-merit on the market. We have therefore developed our semi-qualitative benchmarking based on many end users and supplier discussions, which can be found within the IDTechEx report: E-Textiles 2016-2026: Technologies, Markets, and Players. There is no clear-cut winner. This is because some approaches win, say, on ease of integration with existing processes or maturity, whereas others win on increased clothing-like appearance and feel. Project Jacquard’s smart jacket, built specifically for urban bikers, is an excellent example of a compromise in these areas, with the look and feel being key in the selection of conductive yarns as the primary material. Still, there is no one-size-fits-all solution and the winner will be specific to an end use and/or a production process. This makes sense as the traditional textile world itself includes many fabric types, production processes and end uses. Despite the appearance of familiarly, this is an incredibly diverse and complex industry. The technology composition will therefore be a mixed bag in the medium-term as e-textile manufacturers will likely select their conductor of choice based on the specific requirements of each application and their own existing production processes. In the long-term, e-textile conductive inks will have a larger addressable market than all the other solutions. This is because they offer the highest degree of universal applicability: their integration is a post-production process that can be used by almost any textile manufacturer unless the fabrics cannot withstand high laminating temperatures or are very loose. In the short to medium term, the risk however is that some end applications are more equal than others. For example, IDTechEx Research finds that smart sports clothing alone will make up 65% of the market by 2020. The challenge is therefore in identifying, targeting and winning in specific high-growth application sectors. IDTechEx Research can help you find and penetrate these sectors. The ink technology however is not yet the finished article. Achieving washability, direct-on-fabric printability and high stretchability are challenging technical requirements. The industry is only beginning to accumulate expertise here. Therefore, this is the beginning of the beginning and we expect better e-textile conductive inks in the future. The process currently is too complicated because the inks need to be printed and cured on a substrate such as TPU before being encapsulated using a similar substrate. The film then needs to be hot laminated over the fabric. This approach improves washability and durability and does away with the technical headache of having to develop a different ink optimised for each fabric substrate, but screams out to be simplified. TPU itself is the first choice of encapsulate but not likely to be the last. This is because it is not the most stretchable thus restricting the clothing-like feeling of e-textiles particularly if large areas are covered. Already companies are experimenting with other material systems such as TPU/silicone combinations. Silver costs can also be a limiting factor. This opens the way for carbon or graphene based inks in applications where high conductivity is not required. In the long term copper inks may also be an option but they have a long way to go to prove their reliability and technology maturity.